I decided to have some fun with the wireless network this weekend. 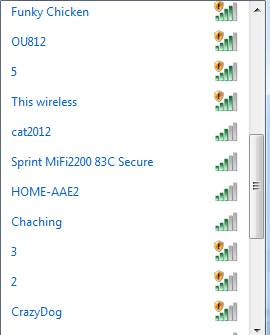 I have a lot of neighbors and when you look at wireless you see a ton of SSID’s. A nifty little program called MDK3 allows you to broadcast a lot of SSID’s. I was watching one of the podcasts I follow and they mentioned the tool. I decided to give it a try on my Ubuntu 12.04 machine. 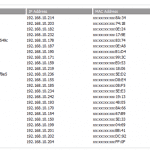 Here is a pic of the final view with all the networks from a windows 7 laptop. Notice all the insecure WiFi networks. I’ll share the list I used later in the post. If you are on backtrack or another version of ubuntu you can just download / unzip / make / make install. On Ubuntu 12.04 you need to make a small modification before compiling. Now to compile the code. If you open your wifi you will now see these networks broadcasted. You can have fun with this. Add in names, sentences, or anything. NOTE: there is a limit of characters shown. Have fun with this. Maybe take a VM running backtrack to the coffee shop and just broadcast a few networks. When is it illegal to listen. Mapping wifi? 5 Responses to "Wireless fun – MDK3 on ubuntu 12"
Hi, thanks to your tuto, I’ve installed mdk-3 on ubuntu 12.10 but, I supose that what you explain after is just the creation of 3 wireless ssid with no further functionality, am I right? You are correct. These are just broadcasted SSID that are not really accessible. Fun to do at an event or public place. Update – I have got a lot of emails regarding this. You will only see these SSID’s when the program is running. They will fall off after you terminate the app.